Unfortunately, these are not of the highest quality, but they still get the point across nicely! 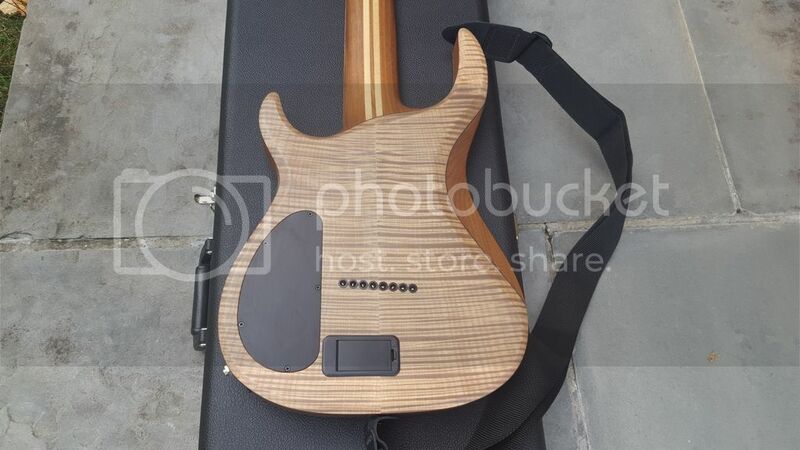 I downloaded the pictures from Jeff Kiesel's Facebook account, as I am not in possession of the guitar quite yet. In fact, I am picking it up as soon as humanly possible from my local FedEx tomorrow after I'm done working, and I could not be more excited. 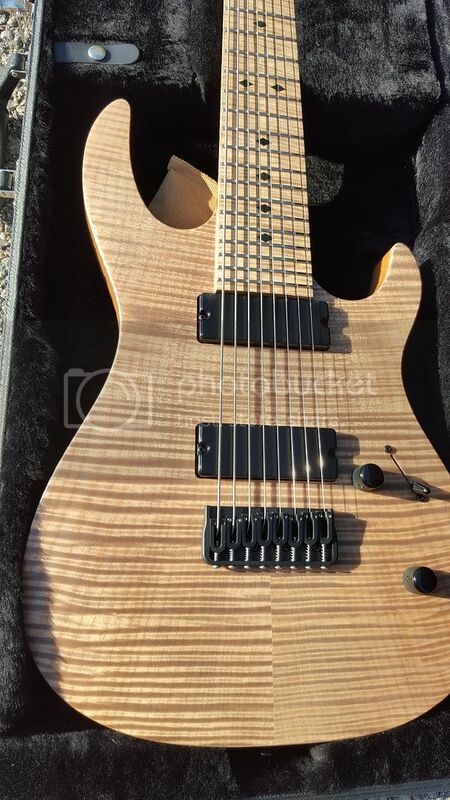 If you frequent the "Guitars In Stock" page of the Carvin website to check out the newest eye candy, as I'm wont to do, then you may have seen this beast of an 8-string on there up until last Tuesday night. That's when I took the plunge. I will re-post here in a couple of days with personal pictures that I've had the pleasure of taking myself! 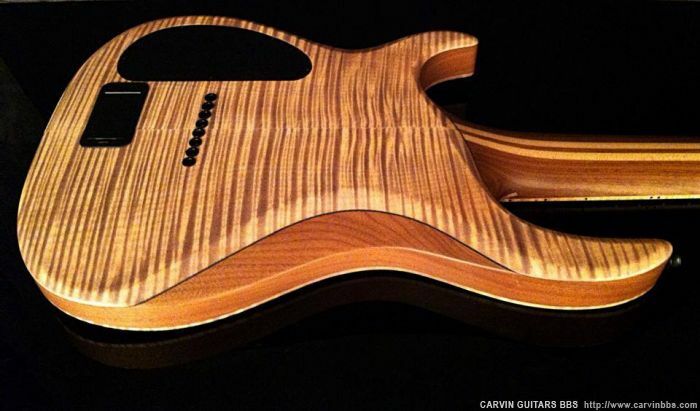 Also, this is my first post ever on the Carvin/Kiesel forums. Hello to all who read this. Freakishly killer guitar!! Congratulations and welcome! Oh yeah, Baby! Love the Flamey goodness! Welcome to the forum and lots more pics of that beauty when you get it! That's one whale of a first post, Patrick! Congratulations on your flaming youth! Yum! Heckofa sandwich you're getting there. Welcome to the BBS! Talk about your flamey goodness. I'm blown away. Sorry to steal your term, Praiser....I do that sometimes when I'm rendered speechless. 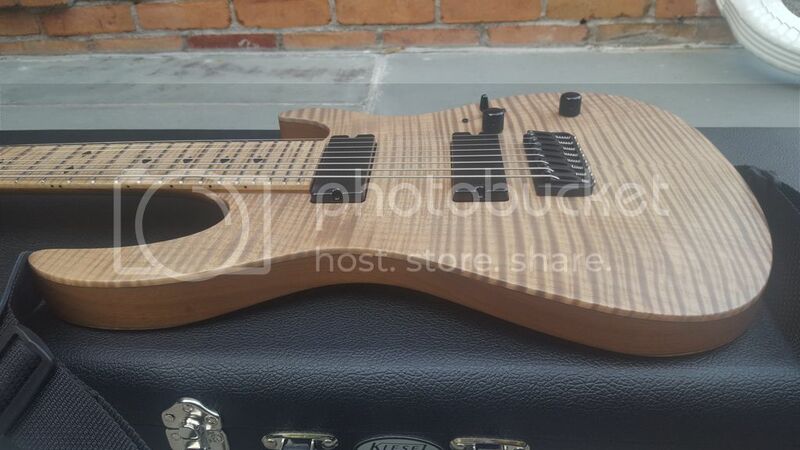 Re: re: Flamed/Quilted Maple Club! skully13a wrote: Word. THAT is outrageous!!!!6!! No worries at all! 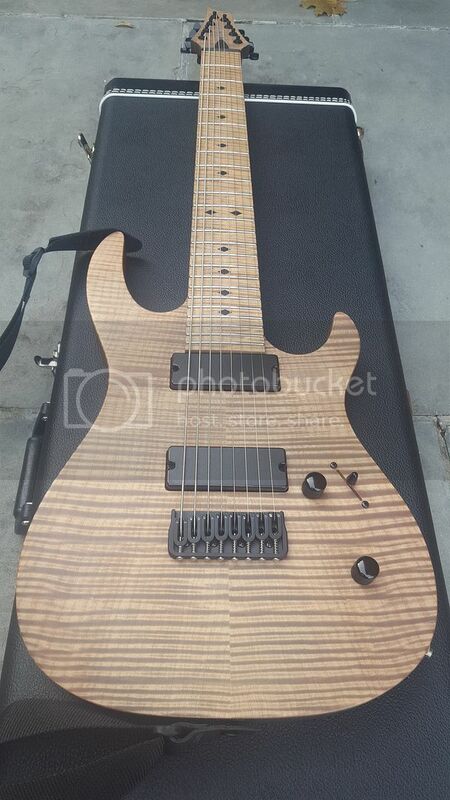 I can't overstate just how much I love the looks of this guitar and can't wait to see more pics of it!! 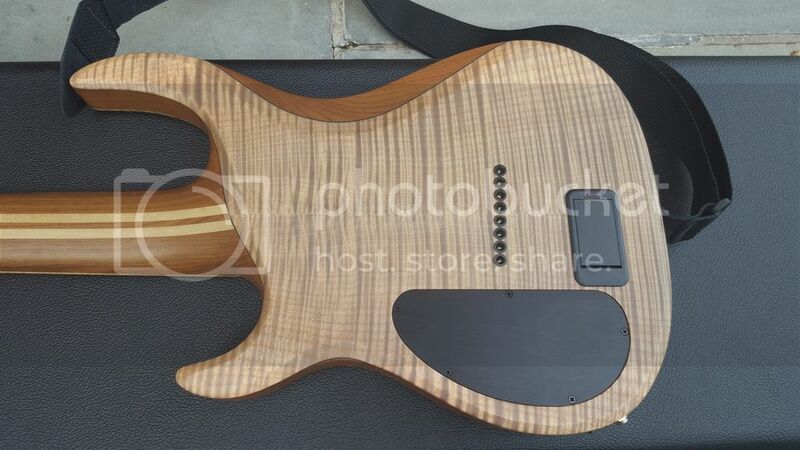 The turkey on multi-grain really is a good example of the luthier's art extending from their elite series basses into the guitar realm, and seems a transitional form between that era and both the Kiesel editions and the Aries model. The guitar is perfect. Just gorgeous. 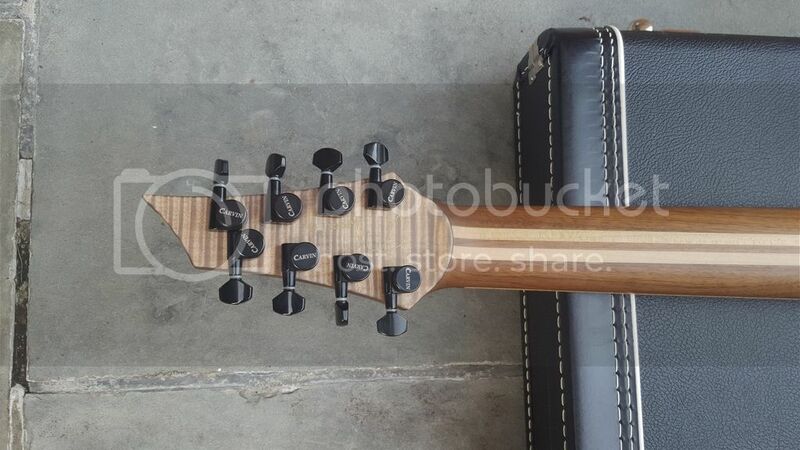 The neck is giant and feels unearthly in its comfort. 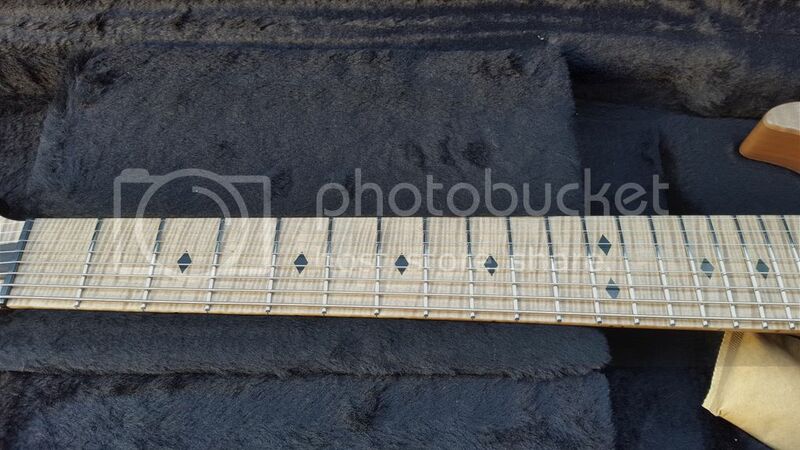 I could not be happier with the purchase, and look forward to playing it exhaustively this winter. When I'm home from work tomorrow I will attempt another upload of the pics from today. Take care, people! Ok, I am now thoroughly aggravated. I took a very nice set of outside pics today and was planning on uploading them with a couple solid indoors pics from yesterday. I am continuing to get the type 500 server error message when attempting to upload. Does anyone have an idea as to why this is happening? Workarounds? I want to share these! Do what I did before I realized there was a native uploader: create a free photobucket account, upload there, and just drop in the share links. Thanks for looking! I am in love. PatrickR58 wrote: Ok, I am now thoroughly aggravated. I took a very nice set of outside pics today and was planning on uploading them with a couple solid indoors pics from yesterday. I am continuing to get the type 500 server error message when attempting to upload. Does anyone have an idea as to why this is happening? Workarounds? I want to share these! For future reference (the longer you hang out here, the more likely you are to use it for something), the forum's uploader tends to "choke" on large image files. The closer you can re-size your images to 700x900 before you upload the better, especially since that's the size it will resize them to anyway. One reminder, though, too...please know that you delete or move the photos in your photobucket account that it will also remove them from the forum. The trade off with photobucket (and other image hosting sites) is that the pics can be much larger, and are less compressed/higher quality. No problem Patrick, I'm glad I was able to help out. That's one wicked looking axe you have there. 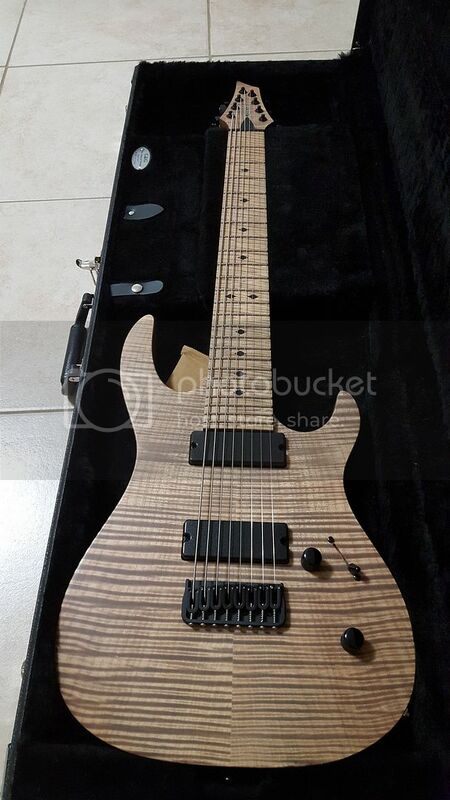 The part-maple neck, with the huge maple top AND back will really help to articulate the vicious baritone growls that thing must be capable of. 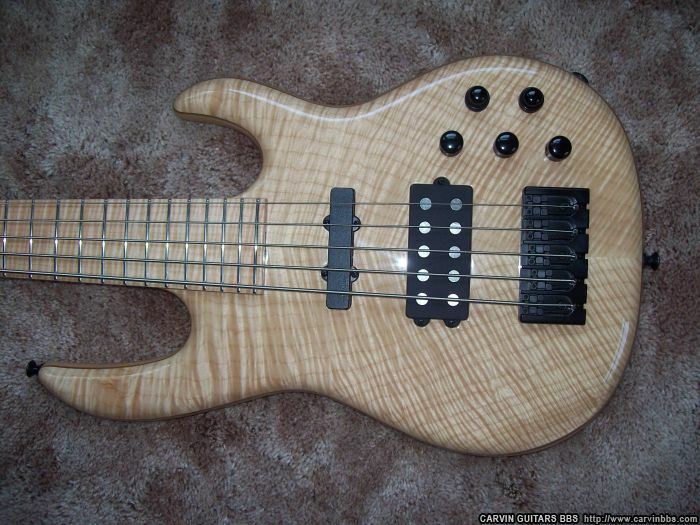 What is the primary body wood--is that alder or hog? And-also--that's a neckthrough, correct? It's just hidden by the addition of the back maple cap, right? Again, congrats on a real unique beauty. If you get a chance a and you don't mind, would you post some sounds? 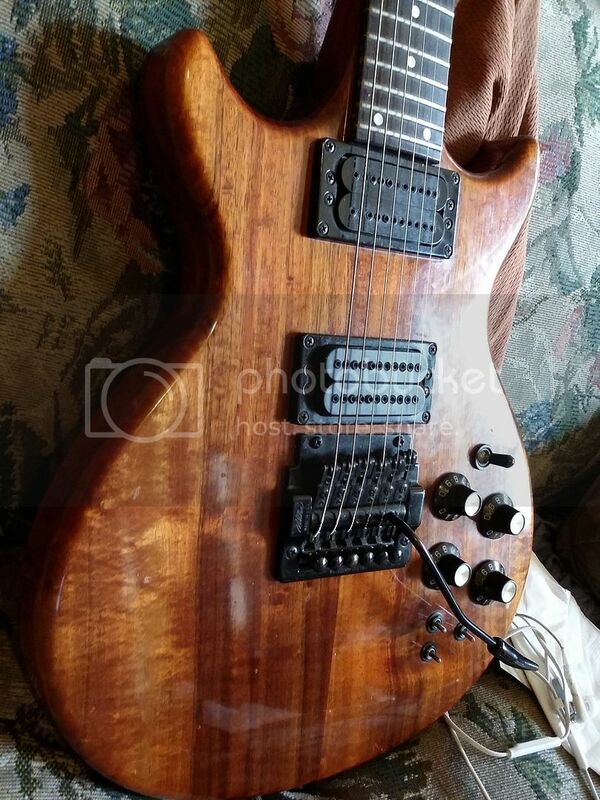 I'd love to hear it clean, esp with the guitar in passive mode and the selector in the middle position with both pickup on (both hum or both split, doesn't matter). 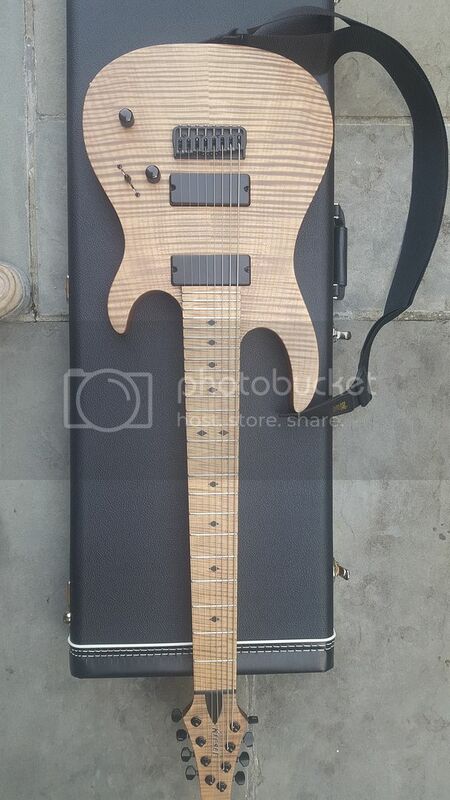 It must sound really interesting with burpy honk you typically get there, but in this case with an 8 string and all that maple! I'd be happy to post some sound clips, but I currently do not have any worthy way of recording myself. I plan to purchase a solid mic and a nice USB interface to record guitar tracks sometime in November. 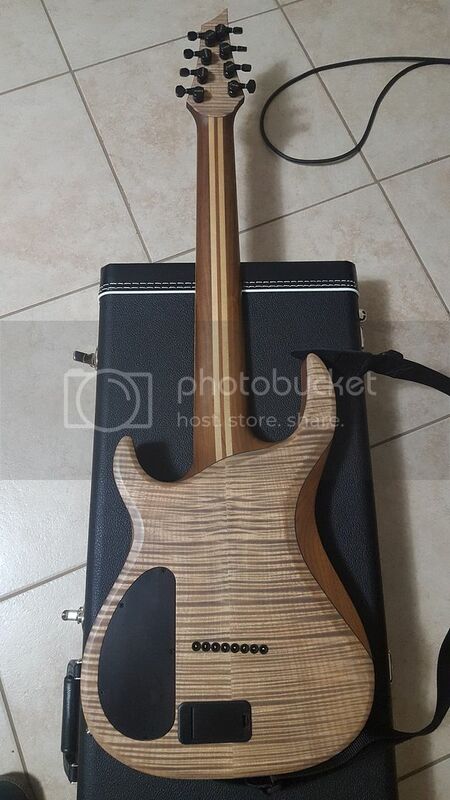 Also, the main body wood is Walnut. And yep, it's indeed a neck-thru, it's just hidden well by that beautiful back! I'm definitely still getting used to the 8th string. My coordination between what my eyes see and my picking hand is still off, more so than I thought it would be. 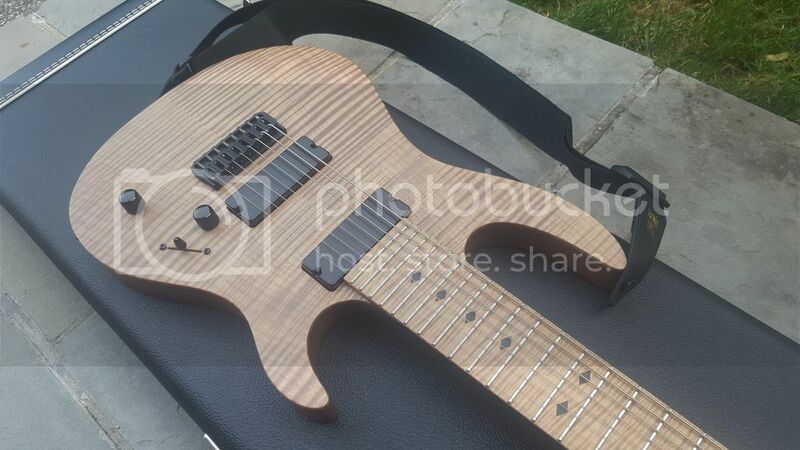 I hope to get some real quality time in with it this weekend, and hopefully next week I'll be back to ripping some riffs out again I can't complain about the playability though, because the neck is FAT and smooth with perfect action. Yum. Thanks for appreciating the new axe, Doc! 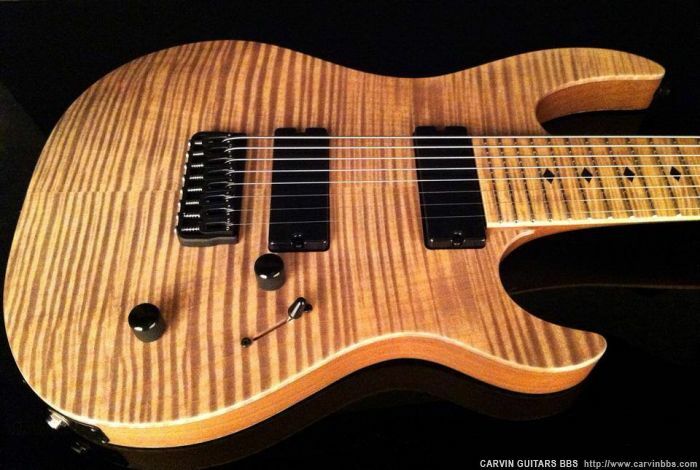 Man, that's a great looking guitar!!! There's not a bad angle from which to view that beauty. Thanks for posting the extra pics, man. Feel free to put 'em up any time.